The fact that it is an imaginary [..] world means that it is somehow set apart from the “real” (or “Primary”) world, with some boundaries between them, making the secondary world a thing of its own; and whereas some boundaries are physical or geographic in nature, such as mountain ranges, deserts, oceans, and so forth (or the surface of the earth itself, for underground worlds), some boundaries are temporal in nature (as in worlds set in the distant past or future, making them equally inaccessible to us in the present), or even conditional, such as in the alternate versions of the Primary world that some stories present. Tolkien separates the two by calling them the Primary world and Secondary worlds (borrowing terms from Coleridge’s discussion of the two types of imagination), and writes that the latter is dependent on the former, hence the term “subcreation” (literally, “creating under”); secondary worlds use material from the Primary world, reshaping and recombining elements from it, so that the end result is both recognizable but also new and different. Building Imaginary Worlds: An Interview with Mark J. P. Wolf (Part One). Outlines history of transmedia „world-building“ in a variety of contexts, from religion to contemporary art practice. Prepared for a student seminar at the University of Southern California’s School of Cinematic Arts. 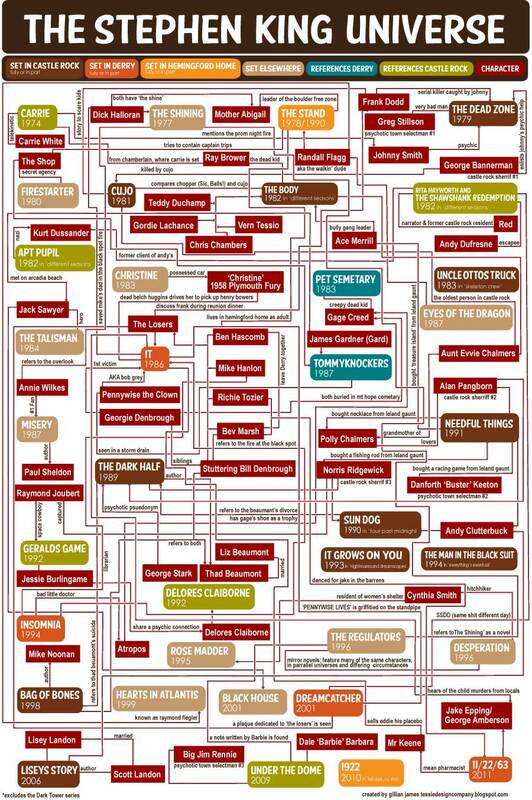 Tessie Girl: The Stephen King Universe Flow Chart. Perhaps we need a different metaphor to describe viewer engagement with narrative complexity. We might think of such programs as drillable rather than spreadable. They encourage a mode of forensic fandom that encourages viewers to dig deeper, probing beneath the surface to understand the complexity of a story and its telling. Such programs create magnets for engagement, drawing viewers into the storyworlds and urging them to drill down to discover more. […] The opposition between spreadable and drillable shouldn’t be thought of as a hierarchy, but rather as opposing vectors of cultural engagement. Spreadable media encourages horizontal ripples, accumulating eyeballs without necessarily encouraging more long-term engagement. Drillable media typically engage far fewer people, but occupy more of their time and energies in a vertical descent into a text’s complexities. via To Spread or To Drill? « Jason Mittell @ Just TV. Drafting the technical manual and ship blueprints was, then, largely a matter of reconciling the “imaginary” object of the Enterprise miniature with the “real” object of sets such as the bridge, sickbay, and engineering, explaining in graphic form how exterior and interior aspects of the Enterprise fit together into a coherent whole. In this sense, Joseph’s work might be described as operationalizing the Kuleshov effect, tying down and standardizing relationships created through editing. The technical materials upon which design-oriented fandom thrives – blueprints, models, hand-crafted props –thus serve an essentially conservative function, knitting together loose seams of an imperfectly-manufactured diegetic reality, as opposed to the exploding/perverting of officially preferred meanings that occurs in fan fiction (particularly slash). I propose that worldbuilding is the primary distinguishing characteristic of SF and fantasy (at least at a superficial level). Get the worldbuilding wrong, and your readers won’t be able to get a grip on the story line or the motivation of your characters. Or worse — they’ll get a grip, and realize that your story is, at best, a western or an age-of-sail yarn with the serial numbers filed off: that the trappings of the fantastic are only there to add a spurious sense of exoticism to an everyday tale. Charlie Stross via World building 101 – Charlie’s Diary. from Jason Mittell. Here’s the accompanying description.